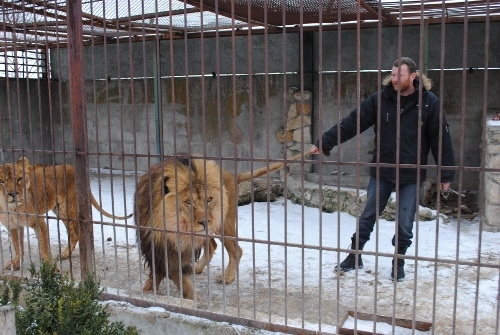 Alexander Pylyshenko, 40, owner of his own private zoo, in the Ukrainian city of Vasylivka, will be spending 35 days caged with two lions, in a stunt he hopes will raise awareness to the poor treatment of lions held in captivity. 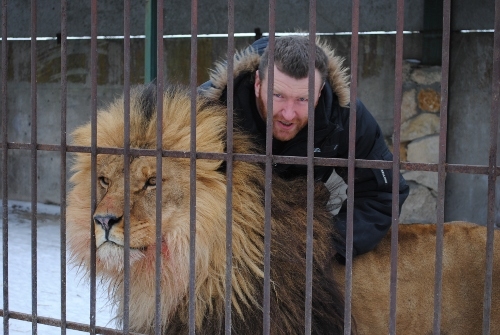 The brave zoo owner says he will live like a lion from the moment he enters the cage. That means he will sleep on hay on the floor and eat from the meat that will be given to the lions through the cage bars. As for personal hygiene, Pylyshenko has built a toilet and shower inside the enclosure, but he’ll have to restrain from using shampoo, shower gel or deodorant, as big cats hate sharp odours. While lioness Katya and her mate Samson seem to get along just fine with their caretaker, things might not be as peaceful when they share a living space 24/7, especially since the female is expected to give birth during the five week period, and lionesses are known to be quite over-protective of their cubs.